The instructions given to the early Church in 1 Thessalonians 5: 17 to “pray without ceasing” is seen in a literal sense in prayer movement 24/7 Prayer. What started as a simple student-led prayer vigil has now become an international, interdenominational movement of prayer, mission and justice. Their vision for a non-stop prayer meeting has continued for every minute of this century so far, in over half the countries on Earth. Red Moon Rising tells the story of 24/7 Prayer. From student filled prayer rooms to the underground Churches in China, the jungles of Papua New Guinea, the slums of Delhi and war zones around the world. For 18 years the powerful stories of prayer found in this book have emboldened and awakened believers to step out in prayer. 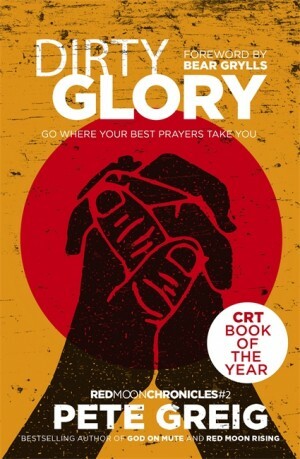 The follow-up, Dirty Glory brings more stories of God moving today. Team leader and Pastor Pete Greig deepens his exploration of prayer by looking at how encountering God through prayer, and what his presence achieves, is still the same powerful rejection of status quo. It’s a challenging read, for those who are dissatisfied and ready to see change. Dirty Glory won't inspire you to pray with comfy stories or healing, but rather show that there is only ever one response to wanting to see God move...To Pray and to Go. But within his teaching on prayer is the very real recognition that life isn’t always easy, that God doesn’t always answer in the expected way. In fact, sometimes it feels like he doesn’t answer at all. Just after the birth of the 24-7 Prayer Movement and of his second child, Pete’s wife Samie was diagnosed with a massive brain tumour. Subsequent surgery to remove the cancer was successful but she continues to suffer terrible epilepsy and his deepest prayers for her healing did not work. In God on Mute, he examines Jesus’ own experience with unanswered prayers, through Gethsemane and Golgotha leading the reader to Easter Sunday where miracles arise when they’re least expected. A new format of Dirty Glory is available now.